The Sony Xperia Z3 Tablet Compact just started shipping in some markets around the world and the producing company is celebrating this event by unveiling a cool infographic related to the tablet. Considering the majority of attention is going towards the Nexus 9 and iPad Air 2 these days, Sony seems to have chosen the right time to remind customers that it too, is offering a worthy slate to be taken into consideration. However, the tablet takes advantage of a smaller form factor than the Nexus 9 and iPad Air 2. Unlike its older siblings, the Xperia Z3 Tablet Compact is an 8-incher working with the same HD Triluminous display technology with full HD resolution. 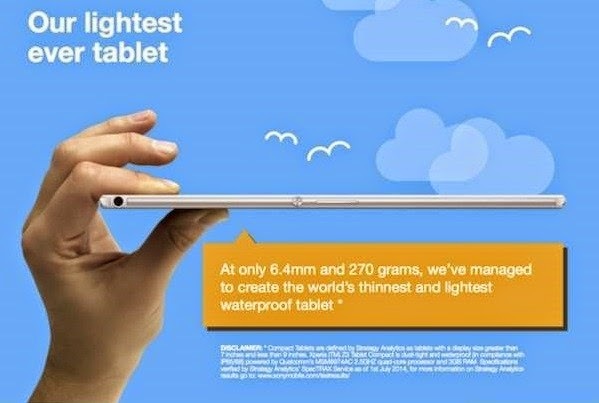 One of the first things Sony mentions in the info graphic is how thin the tablet is. The company touts the Xperia Z3 Tablet Compact as the skinniest in its lineup, coming in at 6.4 mm / 0.25 inches. It also weighs a meager 270 g / 0.5 lbs which is comparable to a hamster or one latte. However, since the Xperia Z3 Tablet Compact came out, two tablets with even thinner frames got announced. We’re talking about the Dell Venue 8 7000 Series with 6 mm / 0.24 inches profile and iPad Air 2 with 6.1 mm / 0.24 inches. Going back to the Sony slate, the model comes equipped with two cameras (8.1MP on the back and 2.2MP up in front) and runs Android 4.4 KitKat out of the box. The good news is that Sony has already announced it will bring the Android 5.0 Lollipop update to the tablet as soon as possible. But what makes this little tablet stand out from the crowd is the fact that it comes complete with integrated PlayStation support. This means that if you can’t use your TV to play a game, because grandma is watching her favorite soap opera, you can take your tablet and pair it with your console instead and play games via the DualShock 4 controller (thanks to the new Remote Play feat). This feature is not advertised in the infographic, which places an emphasis on the IP 65/68 specifications instead. Sony says 1 in 5 mobile phones are damaged due to the devices being dropped in the toilet (really that’s what it says), so the new tablet follows the company’s tradition and is also waterproof to prevent accidental damage.